Roasted asparagus – a quick and easy side dish! Learn how to make baked asparagus in the oven and bring out the flavor with a little balsamic! I haven’t finalized our Easter dinner menu yet, I want to make too many things:) I do know that asparagus will be one of our side dishes. Asparagus is in season and I can’t get enough. We made our lemon asparagus the other night for dinner and it was divine. I think we will make roasted asparagus with balsamic vinegar on Sunday to switch things up a bit. 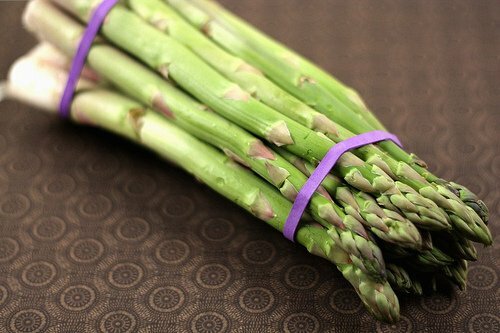 First, make sure you pick asparagus that is bright green and medium in size. You don’t want the spears to be too thick or too thin. I always look for medium size. Get rid of the woody ends by cutting them off or you can break them off. They will snap right off! I love how simple this recipe is. 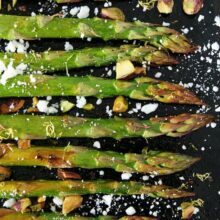 All you have to do is drizzle the asparagus spears with balsamic vinegar and a little bit of olive oil. Season with salt and pepper and roast in the oven for 10-15 minutes. 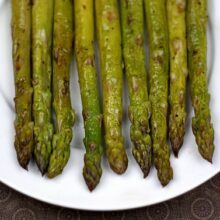 Make sure you roast the asparagus at a high heat, I do 400 degrees F.
I like to line a large baking sheet with aluminum foil so the pan is easy to clean up. You don’t want to over cook the asparagus, you want the spears to stay nice and crisp. 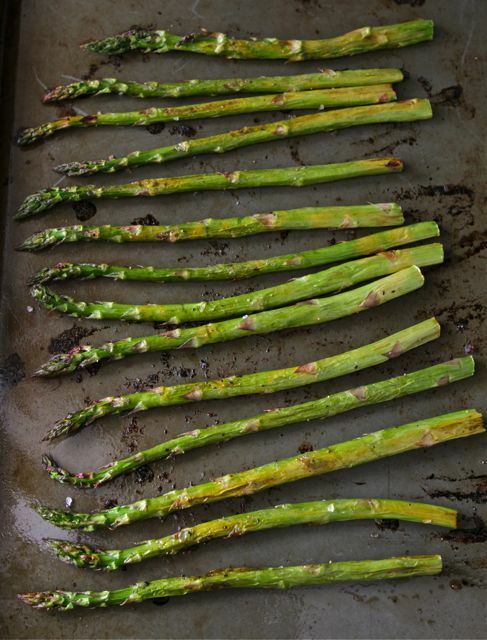 I love asparagus in many forms, but roasting it with a little balsamic vinegar really brings out the best flavor. 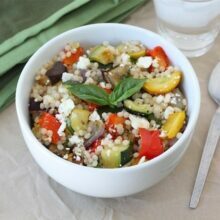 This healthy side dish is the perfect accompaniment to any spring meal. Add it to your menu today. This easy roasted asparagus goes great with any meal! Preheat oven to 400 degrees F. Line a large baking sheet with foil. Spray with cooking spray. Place the asparagus spears on the baking sheet. Drizzle asparagus with balsamic vinegar and olive oil. Roll the spears so they are all well coated in the balsamic and oil. Season with salt and pepper. Roast for 10-15 minutes. or until tender. I stir the asparagus half way through. Serve hot. Roasted asparagus is one of my favorites! Sounds like a terrific dish for Easter. I love asparagus! 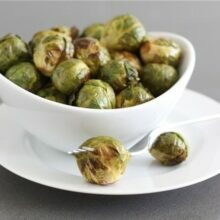 When they are roasted, they have a lot more taste… Great combo! I rarely crave veggies, but this is making me want some! 🙂 Yum! I love cooking asparagus like this! I’ve just recently started coming around to eating asparagus! It’s got to be oven roasted, though. Love this version! Two of my favorite things. Asparagus and balsamic. Thanks for the recipe. Roasting the asparagus really gives it a lovely flavor. Nice touch with the balsamic vinegar. I made something similar to this the other day. I bought white asparagus yesterday so I think I will try it on that too. Mmm, bookmarking this for this weekend! Roasted vegetables with Balsamic Vinegar is the best! I recall asparagus as a kid and how much I hated them; think it was actually canned. I truly think I could eat asparagus every day and wondering if you have ever grilled them? Very similar but definitely results in a flavor component from the grill and cleanup…well, none! What a great recipe! I love balsamic vinegar! What a great twist! I, as well, can’t seem to get enough fresh asparagus right now! I just had some last night. I’ll use this tip when I prepare the rest of it. YUM! I’m with you, roasted or grilled asparagus demands simplicity…some good olive oil and quality balsamic. Oooh, that sounds like a fab combination. I love roasted asparagus but I’ve never tried drizzling it with balsamic before cooking before — can’t wait to try it! This looks wonderfully seasonal. Perfect as a side-dish for Easter Sunday. I am only in charge of the dessert for Easter and I am overwhelmed with that alone! So many choices…I can’t choose! This asparagus looks delightful. I’ve been loving it as well lately. Next time I’ll spruce it up with some balsamic! Asparagus and Easter just seem to go together. I love this simple recipe. Thanks for sharing! I’m having some asparagus for lunch as I read this. Love it. So do my boys, actually. Which is really nice when the kids actually like a vegetable. I’ve never tried it with balsamic. Mmm! This is a great recipe. I mean, how utterly brilliant to drizzle the asparagus in the oil and vinegar before roasting instead of after! Wonderful way to cook and serve asparagus. Sometimes simple is really the best! Roasted asparagus is amazing and I love this version with balsamic vinegar. Yum! I just love roasting asparagus. They haven’t come into my farmer’s market yet and I’m just dying for something to tell me yes, Spring is really really here. Sounds fab! I love asparagus. Mmm. i am SO all about balsamic as of late. I can’t wait to share a recipe soon! Love asparagus..can’t wait to try this! I love balsamic with asparagus – this is a tasty and healthy side dish. I love asparagus…I think we might make it for Easter. I just started my asparagus fever. I made a frittata today. Roasted asparagus is something everyone will love. this is gorgeous, perfect for spring! Love asparagus here too! Your photos just make one want to reach right in and take some! This sounds so simple and delicious! Love asparagus! I just bought a huge load of asparagus; i need to try this! I love asparagus and these roasted ones with balsamic are just perfect. I bet you guys will have quite the spread for Easter!! Wish we were closer, I would dress up like a bunny just to get some great eats! Roasting is one of my favourite ways to enjoy asparagus – never tried dressing them up with balsamic vinegar though, but sure sounds tasty! Mmm…this looks so wonderful. We’re not in Asparagus season yet, here in Ontario, but I can’t wait until we are. Just four or five more weeks to go! Thanks everyone. I hope you enjoy some roasted asparagus this spring! Wow, so glad you commented on my site, because I can now bookmark yours and find all sorts of yummyness! I love asparagus!! I am alllll about the spring asparagus! I just made roasted asparagus and tomatoes tonight. I was actually thinking it would be a whole lot tastier (not that it wasn’t delicious) with balsamic vinegar. I’m trying this next time. Can’t get enough of spring asparagus! I made your feta and artichoke frittata, on my blog today, and it was lovely. Stacey-we love that frittata, glad you enjoyed it too! 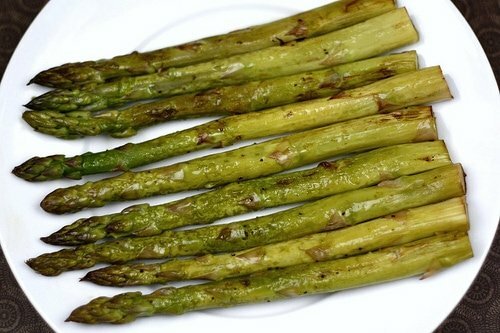 Mmm, roasted asparagus sounds so yummy right now – yay for spring veggies! Sounds like a perfect combination of flavors. Wising you both a Happy Easter! I must try this recipe! I will eat anything involving asparagus. YUM! I have been eating asparagus like crazy lately, and this sounds like a great way to have it! 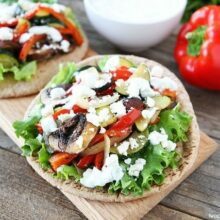 I LOVE balsamic vinegar with veggies! YUM! I agree about roasting asparagus. So delicious!!!! I will try it with the balsamic. Thanks!!! this is my favour recipe whit balsamic vinegar. For the balsami vinegar’s lover signal my family’s old cellar at Modena: Acetaia di Giorgio. We produced balsamic vinegar from 1870. It is the best time to make a few plans for the long run and it is time to be happy. I have read this submit and if I may just I want to counsel you some interesting issues or tips. Maybe you can write next articles referring to this article. I wish to read more issues about it! Im going to try the recipe . it does look simple and tasty .